In June 2010, The RE Store deconstructed a 30’ x 30’ cabin on Lake Whatcom in Bellingham. The first step was to salvage the quality SnapLoc brand metal roof that was still in great condition. Meanwhile, back at the store, we knew we needed to do something about our rotting siding on the exterior north wall of our building. 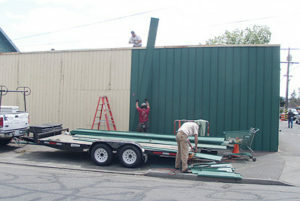 The T1-11 siding had been installed incorrectly many years before we acquired the building in late 2006. The T1-11 was missing the Z flashing that prevents rain from entering the building – not such a good thing in Western Washington. We were on the lookout for some used material to go over the T1-11, and this cabin’s metal roof was just over twice as long as we needed. 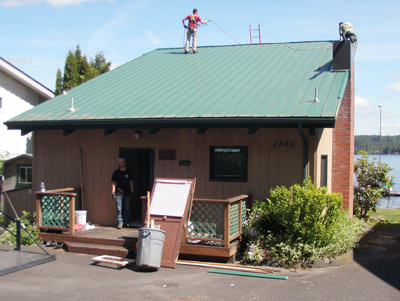 On a dry summer day a few weeks later, our crew installed the roofing as siding. We’re pleased to report it snapped together just fine for the second time in its life, and went up very quickly, too. We expect the north wall to be good for another 50 years!